One of the best gaming laptops just got faster—and a little controversial. Gigabyte's stunning new Aero 15 adds a six-core Intel CPU and high-refresh panel while sticking to its mantra of great battery life. Okay, we made that up, but one of our favorite gaming laptops from last year just got a whole lot faster without giving up the one thing that mattered: battery life. Gigabyte’s Aero 15 series now features Intel’s new 8th-gen, Core i7 CPU inside. That means six cores of blistering Coffee Lake IPC in the same 45-watt footprint. NKRO: The original Aero 15 was plagued by rollover key issues. If you pressed a complicated key combo, the result wasn’t always what you pressed. The updated version adds a full n-key rollover design, allowing you to press every key on the machine at once and actually get the correct results. High-refresh, no G-sync panel: One decision that’s sure to elicit response is Gigabyte’s decision to jettison a 1080p, 60Hz MVA screen for a 1080p, 144Hz IPS display. The new screen isn’t based on Nvidia’s G-sync tech, which ties refresh to the GPU’s frame rate. Gigabyte’s rationale was to save battery life. While variable refresh rate technology delivers beautiful gameplay, it requires the GPU to be active at all times. Gigabyte instead uses Nvidia’s Optimus tech, which switches over to Intel’s low-power integrated graphics when you’re not gaming. 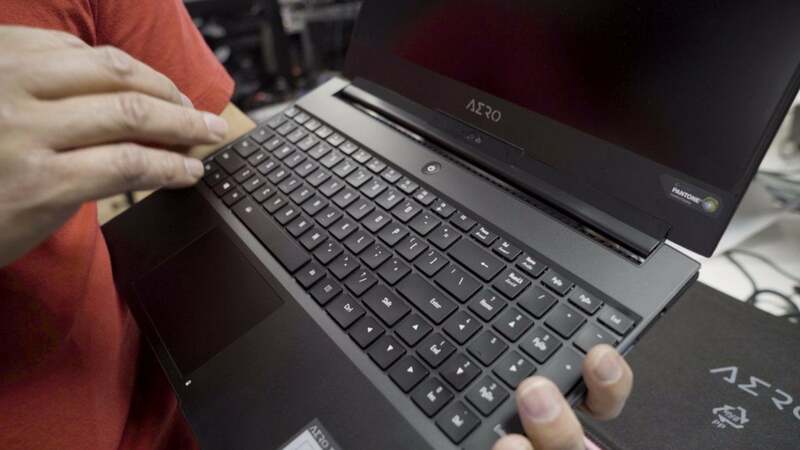 A little lighter, a little thinner: That panel change also makes the new Aero 15 a little lighter and a little thinner. When you consider that you’re now getting a far more powerful CPU inside, that’s quite a feat. The Gigabyte Aero 15 with Intel’s 8th-gen Core i7. The rest of the Aero 15 should seem familiar, with the most important feature—the graphics—staying the same. You’ll find a 6GB GeForce GTX 1060 inside the Aero 15, while the Aero 15X features a GeForce GTX 1070 Max-Q. All this performance doesn’t come cheap. Gigabyte says the Aero 15 with a GeForce GTX 1060, 16GB of DDR4 memory, and a 512GB SSD costs $1,999 at Newegg. The Aero 15X’s more powerful GTX 1070 Max-Q graphics comes to $2,299 at Newegg. A 4K version is planned for release in May with a price of $2,499 on Newegg.